GMM Springs: The GMM can also be used to monitor Back to Floor closure. 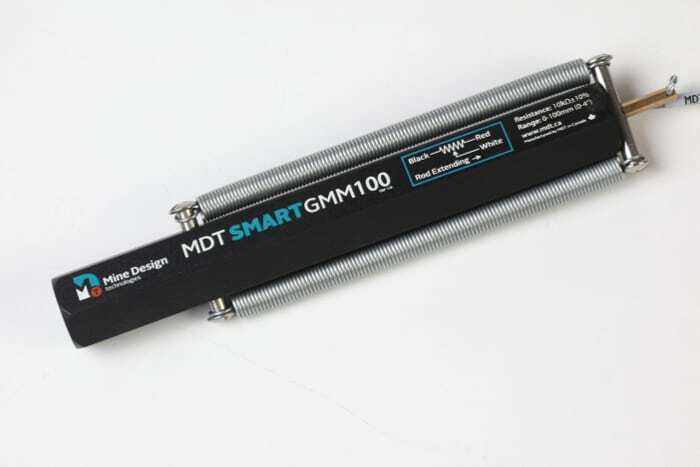 MDT has implemented a simple to use self-retracting spring kit (PN: GMM-SPRNG) that when coupled with a GMM100 eliminates the need to weigh down the GMM. The GMM100 is installed by attaching aircraft cable to the back. The GMM100 is threaded onto to a floor anchor and the cable lopped through GMM-SPRNG kit. The cable is then pulled taught, against the force of the springs, to the GMM100 maximum stroke. As closure occurs, the springs maintain tension, and the stainless steel rod plunges into the GMM100. The before and after readings are then used to determine closure.